DO NOT READ THIS PULBICATION IF YOU MAY BE OFFENDED BY INFORMATION THAT CONFLICTS WITH YOUR ESTABLISHED THOUGHTS, EDUCATION, RELIGION, OR CULTURE; OR ARE NOT RECEPTIVE TO OLD TRUTHS THAT ARE EXPRESSED IN NEW WAYS. Many religious skeptics and devout believers notice disharmony in the Religious Community, especially among pious Jews, Christians, and Moslems, who profess to follow the same God of Abraham, Isaac, and Ishmael, yet whose varying interpretations of "The Book" may well approach the number of sand granules in the Sinai Desert. People should not falter in their faith or be embarrassed by this confusion. The Author of the Bible code, the One who holds the entire universe in His grasp, plainly foresaw that Satan would cause chaos among His followers. Jesus was the “prophet” promised in Deuteronomy 18:15 of whom God commanded: " you shall hear." He sent this warning: "For there shall arise false Christs, and false prophets, and shall show great signs and wonders; insomuch that, if [it were] possible, they shall deceive the very elect (Matthew 24:24). The Apostle Peter correctly predicted that "followers" would be "contaminated": "There shall be false teachers among you, who secretly shall bring in damnable heresies..." (2 Peter 2:1). And Paul also knew confusion would follow his departure and left this message: "Also of your own selves shall men arise, speaking perverse things, to draw away disciples after them" (Acts 20:30). These predictions were soon to fulfill; in fact, the early church of Ancyra in Galatia was plagued with pseudo-prophecy. While denigrating valid Bible teachings, some members would fall into a kind of trance and unnatural ecstasy and chatter and talk nonsense (Eusebius, The History of the Church, Penguin Classics, 1989. pp 160-167). Regardless of religious irregularities, God patiently allowed obvious error and disharmony to exist because He had a solution, and it lays encoded on two obelisks, that is, the monuments engraved with His ten-commandment law. It is used to reveal another encoded message in the twelfth chapter of Daniel, "sealed" for over 2,500 years. Twice within that chapter Daniel is told these predictions were not to be understood until the close of history. In verse four we read: "But you, Daniel, shut up the words, and seal the book until the time of the end...." This statement was followed with a mysterious number in verse seven. Then two more encoded numbers appear after verse nine admonishes: "Go your way, Daniel, for the words are closed up and sealed until the time of the end. 'Many shall be purified, made white, and refined, but the wicked shall do wickedly; and none of the wicked shall understand, but the wise shall understand.'" The "Lord of the code" has patiently waited until "the time of the end" to revive important truths essential for "the wise." That is what this book is about: it educates in these forgotten truths; and, as one enlightened reader from Dallas, Texas, says: "Isn't it wonderful how God puts things in the right perspective." First published on the Internet (www.revealed.org) in 1998, this material received over 40,000 "hits" that year. In printed format, you can read it while away from a computer and, more importantly, share it with your friends. But before we get into the book, let us talk a little more about what the Bible code reveals. Although providence allowed 30 years to pass before giving me precise timing of verse seven, the most confusing part of Daniel 12 are the encoded 1290 and 1335 day prophecies of verses 11 and 12. Failing to find a single scripture hidden somewhere in the King James Bible to "unlock" these numbers, I began thorough readings of several different Bible translations from Genesis to Revelation. This study revealed the encoded "key" by comparing the creation account in God's law or Genesis with another scripture--this will be explained in the following chapter, "The Daniel 12 Code Revealed." Since discovering the scriptural "key", I have often been amazed how God could close Daniel 12 until now to be unlocked so easily as earth approaches its demise. An important part of the prediction authenticates Jesus as the enabling Sacrificial "lamb" for humanity. This truth is increasingly ridiculed by agnostics and belittled by various religious elements. The essence of Bible truth tells of the fall and degradation of earth by Adam's disobedience. Adam was God's appointed ruler, and the only available solution to restore the unity of this lost planet with God's universe required the "LORD your God" to become a man--assume human form as the "last Adam", live vicariously without sin, and die an atoning death as man's substitute. Through our first ruler's sin, separation from God and death passed to all men, but through Christ's vicarious life and death, all of humanity, whether righteous or sinful, will live a second time--the non-compliant must then stand before the judgment seat of God; they are not held accountable for Adams transgression, but for their own selfish ways (Daniel 12:2; 1 Corinthians 15:22; 2 Corinthians 5:10). Christ accepted the punishment for His faithful subjects and also gained the right to the dominion Adam forfeited; "It will come to You, even the first dominion" (Matthew 5:5: Micha 4:8). That is the legality of God's dealing with transgression, but this offers no enabling remedy for our weakened and perverted nature that unfits us for residency in heaven with holy beings. So, that same condemning law that was inscribed on tables of stone is activated as "The kingdom of God is within" and our immaculate Creator reigns in our weakened psyche; His enabling presence unites us once more with His dominion (which is the immaculate universe) and His imparted righteousness enables us for future residency there (Jeremiah 31:33/Hebrews 8:10; Luke 17:21). For those seeking an increased understanding of God's plan to redeem and restore our unity with the universe, and who need their faith in the crucified Savior strengthened, Daniel 12 emphasizes Christ's enabling sacrifice for us. It also confirms Jesus' warnings concerning the Abomination of Desolation who first century Christians knew was Rome. Why is this generation the only one allowed the privilege of understanding these encoded prophecies? I wondered. This information would have proven useful to strengthen faith as Christians faced Nero's lions. And give credence to their decision to vacate lands and dwellings during the brief period of victory after the aborted siege by Rome and the temporary liberation of Jerusalem in 66 A.D. And added a margin of comfort to those of independent mind and the Reformers as their bodies throbbed with pain and terror in torture chambers or from burning faggots piled at their feet. This is all precisely true, but you must understand that because people were being persecuted by an "official" state religion recognized by governing bodies, there was no doubt in their minds that Rome was the Abomination of Desolation that the Bible warns about. This is not true of humanity today--we either do not remember, are indifferent to what Rome did, or are ignorant of the numerous Bible cautions. It now appears to the unwary that those episodes have passed into the archives of history and we are an "enlightened generation." Rome has apparently changed!, we say, and this makes us extremely vulnerable to future deceptions. This is exactly how Satan would have it and exactly in accordance with his plan. In His divine providence, God knew that after the great tribulation of the "Spiritual Dark Ages" (closing in 1798) humanity would eventually forget the lessons learned from the Bible and history, and be charmed by overtures of peace, love, forgiveness, and kindness from the leadership of this organization; therefore, God delayed the full understanding of Daniel 12 to remind us that the last-day deceiver is still the Abomination of Desolation of history. This should encourage us to exercise caution and study significant errors they introduced into Church doctrines. The Bible plainly predicts that this deceiver will persecute God's people again and hamper their ability to obey His ten-commandment law--this will also be fully explained in this book. It is not my natural disposition to point fingers or subject myself to controversy, so I refrained from publishing this information for over two decades hoping God would lay the burden on others. With great reluctance it was published because of increased advances by the unwary to integrate with this institution; yes, it is imperative that this information be disclosed. Contrary to Western beliefs, about 20 per-cent of our world population are non-violent follow-ers of Islam who seek a deeper knowledge of God’s will in their lives. They anticipate the judgment day, which includes the coming Kingdom, and covet the peace promised in the Koran. The writings of Mohammed encourage the study of the prophets who are all descendants of their “father”, Abraham. These “descendants” authored much of the Old and New Testaments many centuries before the Middle-East land dispute that ignited in 1948. For the benefit of Christians who are concerned about Muslim roles in Bible prophecy, last-day events, and Islamic fundamentalists, at appropriate points the teachings of the Koran are compared to “the Book” (The Holy Bible). Additionally, in the Appendix there is a short article describing the rise, decline, and death of Islam as described in biblical prophecies. Meanwhile, we must speak well of dignitaries and respect and pray for our Statesmen to make wise decisions as we face perilous times that our world has never encountered (2 Peter 2:10; Jude 1:8). Our governments are "ordained of God...." and Christians should be model citizens (Romans 13:1). But in the "New Testament", God set a standard of high integrity for church leadership and Christians were instructed to shun and criticize bigoted religious teachers "before all, that others also may fear"; in fact, the apostle Paul called the High Priest a "whited wall" (2 John 9:11; Romans 16:17; 1 Timothy 5:20; Acts 23:3). Governing bodies, however, are to be respected even while erring, and Jesus' disciples rejoiced because of injustices against them by the authorities (Acts 5:41). When legislators err, they are still "God's ministers", even when forcing obedience contrary to His law; God is merely using them to test faithfulness while developing "the patience of the saints" (Romans 13:1-6; Revelation 13:10; 14:12). Christians must not resort aggressively to grievances against lawful authorities, and if by humbly refusing to disobey the Bible tries your loyalty to God and subjects you to scorn, be aware that heavenly agencies have already made provisions for God's faithful saints who, like Jesus, peaceably face death rather than violate the superior ten-commandment law of the great Jehovah. It was not Moses, but God, that caused the destroying plagues on idolatrous Egypt and delivered Israel from Paganism--His subjects merely followed divine instructions instead of yielding to Pharaoh's demands. And had the populace obeyed the priests and rulers who condemned Jesus, there would be no Christianity today. Early Christians believed in the validity of God's ten-commandment law which prohibits worship of emperors claiming divinity--these faithful subjects humbly accepted death in the Coliseum rather than offer the smallest quantity of incense to Caesar because God said: "You shall have no other god's before Me" (Exodus 20:3). As the Abomination of Desolation and its accomplices coerce government leaders to legalize sin, legislators must "not allow it to happen on their shift" like the spineless Pontius Pilate or deluded Pharisees--they are, like you, culpable before the judgment seat of God for knowingly breaking the supreme laws of Heaven. God demands that His people give precedence to His righteous commandments that safeguard His sovereignty: "We ought to obey God rather than man"; and He pleads: Come out of her, my people, that you be not partakers of her sins, and that you receive not of her plagues (Acts 5:29; Revelation 18:4). Obeying God is of supreme importance, and this is the reason for publishing The Wise Shall Understand; for your benefit it offers rational solutions and unmasks many of Satan's greatest delusions that are peddled as facts. It is a misnomer for me to imply that "I discovered the hidden code." True knowledge only comes from Him who is infinite in wisdom and the revealer of secrets: "A man can receive nothing, except it is given him from heaven" (John 3:27). And this principle applies to you: "See all this; and will you not declare it? I have showed you new things from this time, even hidden things, and you did not know them" (Isaiah 48:6). A Gospel minister in Canada was searching for a greater understanding of the Bible. His letter of appreciation says: May God bless you for making this information available to me. I would never have dreamed I could learn so much about the Bible, and now I know the message God would have me give to those He has entrusted to my care. To either discover or understand spiritual truths requires your cooperation--a deep soul searching. Jesus said: "If any person wants to obey God, he will know of the truth, whether it is of God or if I speak my own words" (John 7:17, paraphrased). Are you willing to surrender complete control of your life to the omnipotent One regardless of intimidation by others? Then and only then will God's Holy Spirit give you discernment; and He, who suffered the greatest agony in your behalf, will never fail you! For these reasons, to properly understand and refresh your memory of these prophecies, you must first take several minutes to pray and read the thirteen verses of Daniel 12--they are listed in the Appendix. As you read, do not be discouraged as you will probably not understand much of Daniel's writings at this time, but they will be clearer as you study this book. Then you will see that Charles Huntley Clever has not created something new; instead, that Daniel 12 has stimulated a deeper search for long-forgotten truths; then you, too, can read the Bible with understanding and say: "Isn't it wonderful how God puts things in its right perspective." As you will soon see, the plan of redemption and restoration of earth is revealed in the Daniel twelve code--from Eden fallen to Eden restored--in a prophecy that was closed until the end of time. Daniel humbly said: "Although I heard, I did not understand...." The angel replied: "Go your way, Daniel, for the words are closed up and sealed till the time of the end.... None of the wicked will understand, but the wise shall understand" (vs. 9, 10). After reading this chapter, you should realize why many historical expositors of Daniel 12 failed in unlocking its code. They did the best they could with an encoded message that was not to be completely "unsealed" until God chose. Therefore, they usually applied the one-day-equals-one-year "key" of Ezekiel 4:6 and Numbers 14:34--an effective tool when computing chronological-timed prophecies (These will be discussed in another chapter). Applying that tool may give one an element of success, but may actually cause confusion with Daniel 12 because the resulting long periods of historical time force scholars to only assign the numeric periods to medieval history. Others speculate on future events. In this they, too, will miss the encoded application necessary to unfold Daniel 12. In addition, please understand that without dispute, Daniel was authored over 500 years before Christ's birth--many portions of manuscript have been found in what we now call "the Dead Sea Scrolls" that are dated before the Christian dispensation. This means that only an omnipotent God could foretell through Daniel 12 some events that would later become part of our known history. It is not wise to set dates for Christ's return--we must "watch and be ready"--Jesus said that only His Father knew the day or hour; yet, the Scriptures plainly state: "At the time appointed, the end shall be" (Daniel 8:19). Even though Daniel 12 does not teach the exact date of Christ's return, it denotes long suppressed epochs--established times and seasons for important events (Acts 1:7). Some touch the time of Christ as the apostle Paul notes: "But when the fullness of the time had come, God sent forth His son..." (Galatians 4:4). This strengthens one's belief in Jesus, the suffering Messiah described in Isaiah 53 seven-hundred years before He become the sacrificial "Lamb" slain for our sins. The unfolding of the Daniel-12 code only requires knowledge of elementary mathematics and some Bible background. It is so simple that you will wonder how God concealed it until our day; even children can understand it. Satan is well able to lessen your comprehension--perhaps you are pressured or distracted at this time. Please turn off the television or move to a quiet place to study; or better yet, read this with your family to allow better comprehension. And more important than this, take time to pray and make certain you have read Daniel 12 (Appendix) before continuing this chapter. Beginning in the early 1970s I was attempting to receive greater understanding of the scriptures by consecutively reading different translations of the Bible from cover to cover. Perhaps, I thought, different wordings may give insight in finding the code. Sensing that popular church teachings include tenants of mythology and human philosophy, I uninhibitedly asked God to be my mentor. Newly baptized and having never read the entire Bible, I was free from the contaminating influence of church tradition and the intimidation of church superiors or denominational payroll. This allowed a pact with God that if He would be my instructor, I would never teach an untruth to support church doctrines; "Show me," I pled, "I will never place my trust in man." Such prayers are exactly what God desires because His Guide Book does not have hidden motives or yield to coercion when humbly studied in its entirety: "If any of you lack wisdom, let him ask of God. . ."; "Thus says the LORD: Cursed is the man that trusts in man, and makes flesh his strength, and whose heart departs from the LORD"; "It is better to trust in the LORD than to put confidence in man"; "You shall not add to the word which I command you, neither shall you diminish from it, that you may keep the commandments of the LORD your God which I command you"; "Do not add to His words [given by prophets], lest he reprove you, and you are found a liar" (James 1:5; Jeremiah 17:5; Psalms 118:8; Deuteronomy 4:2; Proverbs 30:6). Although God's Word sanctions the unity and stability that Church fellowship and organization affords, church leadership is bound to Christ's commission to His disciples: "Teaching them to observe all things whatsoever I have commanded you"; in other words, one must avoid interpreting the Bible "to their own destruction" by explaining Scripture according to Christ's teachings (Matthew 28:20; 2 Peter 3:16). Although the Bible authorizes the training and ordination of church leadership, the writings of God's prophets (including Jesus) are readily available and must be humbly studied in their entirety and remain your primary guide because the scriptures define sin and offer no alibis for transgression (Matthew 10:41; James 1:5,6; Titus 1:5). God has ordained that His Word be readily available and accepts no excuses from those neglecting its study. It is literally "God breathed": "All Scripture is inspired [breathed] by God and is profitable for teaching, for reproof, for correction, for training in righteousness: That the man of God may be perfect, thoroughly furnished unto all good works" (II Timothy 3:16,17). In the future we must individually answer to the One who can never be intimidated or bribed--"every one of us shall give account of himself to God"; to be saved you must "hunger and thirst after righteousness [right-doing]" remembering that your weakness and great need makes you strong in God's omnipotence (Romans 14:12; Matthew 5:6; 2 Corinthians 12:10). Only by reading the entire Bible can it be correctly interpreted, by studying "line upon line" (Isaiah 28:10). For example, when comparing the Bible with First Corinthians 15, that chapter speaks strongly of, and proves to skeptics, the validity of Christ's resurrection from the grave. Knowing this, you would understand Paul's thought-provoking question in verse 29 correctly: "Why are they [who do not believe in Christ's resurrection] then baptized for [Jesus] the dead [Savior]....? "; instead of, "Why are they then baptized for their [deceased friends and relatives]....", a practice lacking biblical precedence. After completing several different translations, I purchased a Jewish Bible called The Holy Scriptures. It is a quality work published by the Jewish Publication Society of America, and has no "New Testament." It was soon discovered that something obvious had been overlooked while reading other translations. Contemporary interpretations of Daniel 12 were incomplete--there had to be an obscure, yet undiscovered, scriptural "key" to give greater emphasis to these encoded verses that were sealed for centuries. Perhaps there is an error in translation, I thought, while struggling with these "sealed" numbers; but an error was not possible because all the manuscripts I checked contain the same numbers--even the Greek Septuagint; this translation was popular in Christ's day. Since we are now living near the "time of the end", the Bible was primarily searched for latter-day predictions and an understanding of the Daniel 12 code. God is faithful to answer prayer, and as you would expect, He gave the correct "key" to solve the puzzle. Now, let us study the "key." You may recall that the fourth commandment of God's law, as well as the first chapter of Genesis, tells us that God created the heavens and earth in SIX literal days: "And God saw every thing that he had made, and, behold, it was very good. And the evening and the morning were the SIXTH day" (Exodus 20:8-11; Genesis 1:31). And "So the heavens and the earth were finished, and all the host of them" (Genesis. 2:1). By comparing these creation narratives with Genesis 2:4, we find an apparent contradiction: "These are the generations of the heaven and of the earth when they were created, in THE DAY (Hebrew, yom, means one day) that the Lord God made earth and heaven." God tells us He created and finished the heavens and earth in SIX DAYS, yet please notice that God calls that SIX-DAY unit of time "THE DAY" (Genesis 2:4). Daniel 12 verse 11 reads: "And from the time that the daily [ministry] is taken away, and the abomination of desolation is set up, [there shall be] one thousand two hundred and ninety days." Wondering if a one-day-equals-six-day "key" could unlock the encoded number, 1290 was multiplied by SIX. This totaled 7740 (6 X 1290 = 7740). With a math background from the study of electronics, numerical repetition in the Bible had caught my attention. And now, 7740--suddenly some familiar integers appeared. At that moment I did not know what 7740 meant, but knew that God had finally revealed the "key" because sevens and forties predominate throughout Scripture. For example, the seven-day week, seven-year jubilee and the seven plagues. . .; and you may recall the 40 days of Noah's rain, Moses' 40 days on Sinai, Israel's 40 years in the wilderness, 40-day fast of Jesus, etceteras. Perhaps you, too, have noticed the repetition of these noble numbers and wondered: Why did God put them there. The answer is simple: God is obviously a mathematician and is trying to tell us something throughout the Bible to substantiate His "end of time" revelation of the hidden code--something concealed from the view of superficial readers. You should now realize that somehow 7740 will identify the point in history when the "daily" (sacrifice offered by earthly priests) is taken away and the abomination that makes desolate established. Therefore, you must study the Scripture with the goal of finding its significance. Once discovered, I realized that the subliminal message encoded in the Bible is quite astounding. And this was about 25 years before Bible decoders, using computerized equal-skip programs, discovered that another encoded message could be found in God's law. God wants us to study His Word; He even commanded its public display (Deuteronomy 27:2,8). In any language, His Bible reveals simple truths like the Daniel 12 code and the identity of its Author that may not be learned by complex computer analysis. And once you discover who the Author of the code is, it should encourage you to study the literal text of His magnificent book, the Holy Bible (John 5:39). The SIX-day code is engraved by God in the fourth of His eternal ten-commandment law (Exodus 20:8-11). One researcher, Michael Drosnin, tells of his quest to find another code in his second edition, Bible Code II--Countdown to Armageddon (In that volume he meticulously refutes accusations of word manipulation). His book says another code can be found by opening two obelisks, or monuments, of sapphire and lime stone, which are written in language mankind can easily understand. Those who have studied the Bible know God first engraved His 10-commandment law on two obelisks (monuments), and wrote them again on the stones Moses prepared. Although some archaeologists plan excavations of Palestine in search of the obelisks, this is not necessary because they are easily found in your Bible as you open God's monuments to His great law. It is His gift to mankind and is preceded with: "I am the LORD your God..." and begins, "You shall have no other gods before Me..." (Exodus 20: 2-17). Drosnin's research tells how the code on two obelisks reveals the Creator's identity, the One who designed our DNA, which He gave as an inheritance for mankind. Truly, God is the author of the complex genetic DNA spiral, with Adam being our original template or model. Those reading Drosnin's Bible Code II, published by Viking Penguin in 2002, especially around pages 152 and 153, should see the connection between our Creator and the Daniel 12 code. The obelisks are only fulfilled through love--God's law replaces about 35,000,000 man-made ordinances; and the "Sabbath commandment" is the only part of his law that contains the imbedded code because it alone identifies the great "I AM" as our Creator. The LORD is also our law-giver who engraved these words in stone two times: "For in SIX days the LORD made the heavens and the earth, the sea, and all that is in them..." (Exodus 20:11). And that same God is the eternal Author of, not only our universe, but that imbedded code that enhances our understanding of His great plan at the time of the end (Daniel 12:4, 9, and see: Drosnin, pp 25, 31-36; 78). Now, let us decipher the meaning of the 7740 in our mathematical calculation. It will prove a humbling experience as you learn the awesome identity of the LORD of the code: "All things [including the Bible code] were made by Him; and without Him was not anything made that was made" (John 1:3). Then, realize the Majestic Creator's great mission: He became the ultimate sacrifice when the Lord your God offered His life for you. This was the only remedy after sin entered His immaculate universe. And unlocking the Daniel 12 code will certainly clarify your understanding of His great plan to restore harmony to His immense domain. Christians have an advantage over skeptics in "unlocking" the code because they understand the significance of the first century--they know that through the blood Jesus shed from His side at Calvary, the symbolic-sacrificial-system of the "Old Testament" met fulfillment; that the temple curtain was torn from top to bottom symbolizing God's departure, and He allowed the Roman soldiers to destroy His temple. Please refer to the third chapter of Luke and count generations, starting with God the Father, and count straight through Christ's genealogical lineage that ends with God's Son, Jesus (The physician Luke knew Joseph was not Jesus' real father, so many believe he traces the blood lineage through Mary), you will see there are exactly 77 generations, the first part of our encoded number. There is another way to calculate this number that may be important because there is a figurative connection between Enoch and Jesus as both were taken to heaven. Count generations from Adam to Enoch, of whom it was written: "Enoch walked with God: and he was not; for God took him" (Genesis 5:24). "And Enoch also, the seventh from Adam, prophesied..." (Jude 1:14). As recorded, we know that there are seven generations. Now, using the Hebrew method of counting that includes both the first and last unit (see an example in Matthew 1:17), from Enoch to Jesus, there are seventy more generations. Jesus also "walked with God... [and] God took Him." Seven generations, plus 70 more, reaches to Christ, again, the number 77. That encoded number reaches to the promised offspring of Adam whose heel would be bruised (it was pierced), and who would bruise the serpent's head (Genesis 3:15). Interestingly, archaeological findings show that some criminals were crucified with the spike driven through their heel; also, as you read, you will learn that Satan's head wound will ultimately be fatal. In the Bible God uses sevens and forties separately, so we will use them individually in interpreting the 7740. Following this logic, let us study the 40 of our factored number. God also uses the word "generation" for both genealogical lineage and 100-year periods. Israel was in Egypt about 400 years and that period of time is called four generations: "But in the fourth generation [century] they shall come here again" (Genesis 15:13, 16). Although there are theories of evolutionary sequencing that traverse millions of years, to uncover the timing of the Bible, chronologists combine Biblical history with known world events to estimate the "in the beginning" of creation (Genesis 1:1). Considering a generation one-century, there are 40 centuries (4,000 years) from the divine creation of Adam to the Divine Embryo created in Mary's uterus nine months before His birth. A popular figure for Jesus' birth is 03 B.C. ; Jesus' humanity really began in the preceding Jewish year as a living embryo in Mary's womb. This was shortly before John the Baptist, in uteri six months, recognized the Messiah's embryonic presence and leaped in his mother's womb (Luke 1:41-44). We might simplify Jesus' humanity by suggesting that God implanted His Son as a Y chromosome in the X chromosomes of Mary's artificially fertilized womb. Virgin births, although uncommon, are not impossible today in surrogate mothers, but they are not of divine origin. Using negative numbers for B.C., and the popular date of 4004 B.C. for the creation of Genesis, Christ's conception may be expressed mathematically as: - 4004 B.C. + 4000 years = - 04 B.C. ; this is 40 centuries to the year of Jesus' humanity. Although hard to understand, Christ's humanity is called the "mystery of godliness", when God identified himself with us by becoming a human fetus, suffered the trauma of childbirth, and thirty-three and one-half years of misunderstanding and abuse by those He loved enough to experience death for (1 Timothy 3:16). Also, we will detail later that another application of 40 centuries is when Jesus, our Creator in human form, faced the wilderness temptations of Satan and was victorious 40 centuries after Adam succumbed to temptation and failed. Additionally, count Matthew's patriarchal genealogy through Joseph, and recorded in Matthew 1:1-16. Starting with the divinely-promised birth of Isaac, the offspring of the aged Abraham and Sarah: "And in your seed [offspring] shall all the nations of the earth be blessed; because you have obeyed my voice" (See Genesis 22:18; and Galatians 3:16), to its accomplishment in the divinely conceived Jesus, the "Son of David", there are 40 genealogical generations; that is, forty generations from the son of Abraham to the Son of God (many believe Matthew traces Jesus' "patriarchal" lineage). The Daniel 12 prophecy says the wicked will not understand; therefore, it is expected that many will ridicule these most sacred revelations and distort my logic as they "trample under their feet..." these simple yet significant truths "and rip" (belittle) me (Matthew 7:6). Please give God's Word a chance and continue to read: the Bible is a marvelous revelation of Christ, the anticipated Messiah. All that is actually required to open the SIX-day code is 77 generations from God the Creator to God the Redeemer and 40 centuries (generations) from the first Adam to, you might say, the second, unfallen Adam, the prophesied Savior and Messiah born about 2,000 years ago (Jesus is called "the last Adam" in 1 Corinthians 15:45). So the numeric prophecy of Daniel 12:11 factored to 7740 does not merely point to a specific date in future or medieval history; instead, it illuminates the first century. That is the most incredible event of eternity, when the "LORD of the code", Christ the Messiah, would come to save this doomed world through his substitutional death. There are several religions that wrongly classify Jesus as merely a faithful apostle or prophet. One alleged prophetess says He actually remained alive in the grave. And a popular religious book, revered by a billion people around the world, implies that they did not kill him, nor did they crucify him, but they thought they did. It further states there is no trinity, that God is but one God, and denies that He could have a Son because His Heavenly Father would have saved Him; yet the Mighty God must not interfere: He gave His son as a sacrificial lamb for the slaughter; and must allow Jesus to perish, otherwise we would all perish (Koran 4:157, 171-172; John 3:16). Abraham is the father of the biblical prophets and according to the Koran, you must obey them; if revelations of subsequent "prophets" (which includes Mohammed) perfectly match the sacred writings of God's prophets recorded in the Holy Scriptures, then you may know God sent them (Koran 2:174-178; Deuteronomy 18:22). Jesus said He would send true prophets, and their words should be compared to His teachings; "By their fruits you shall know them", He said (Matthew 7:15, 16; 23:24; Isaiah 8:20). God gave us prophets to foretell the future because: "Where there is no vision, the people perish" (Proverbs 28:18). The Koran tells followers what to do, such as how many wives they may have or rocks to use in cleaning, but it does not detail future events. The Bible prophets predict the future; in fact, the book of Revelation mentions the word prophecy seven times, such as: "Blessed is he that reads and they that hear the words of this prophecy, and keep those things which are written therein" (Ibid. 1:3). In addition to sending us true prophets, Jesus explicitly warns that false prophets and saviors would come (Matthew 24:24). John the Beloved is one of God's prophets and writes, "Who is a liar but he that denies that Jesus is the Christ" He is antichrist, that denies the Father and the Son" (1 John 2:22). This conflicts with the Koran. It classifies as infadels or unbelievers those who believe that God [Jesus] is the Messiah, the son of Mary (Sura 5:17). Being stigmatized as an unbeliever carries the most serious condemnation in the Koran (Sura 9:73; 9:123). The accuracy of the Old and New Testaments are well established by extant manuscripts, and God's plan to redeem mankind is confirmed throughout the Bible. And now, unfolding the SIX-day code at the "end of the days" becomes one more significant discovery to validate Christ's mission with even greater emphasis. Another prophecy predicting Christ's death is found in Daniel 9:27. This Messianic prophecy of the "Messiah the Prince" is greatly misunderstood and often erroneously applied to a future date, individual, and event. Now that the SIX-day code is revealed, we know with certainty that it applied to Christ's great sacrifice for mankind because, "the daily" mentioned in the 1290-day prophecy is "taken away" at the cross when "He [Jesus] shall bring an end to sacrifice and offering" (Daniel 9:27 quoted). We know that the pronoun "He" in that verse refers to Jesus, the Messiah--not to a future "antichrist" as falsely presented from many publications and pulpits today; because, the antecedent, the "Messiah the Prince" (verses 25 and 26) who would be "cut off [killed] but not for Himself", is Jesus the Son (Prince) of God who was slain for us. Many witnesses saw Jesus' empty grave; to silence their testimony the embarrassed priests paid large sums to the Roman guards to say He was stolen from them--the truth is, Jesus is risen, and forever intercedes for us in heaven (Matthew 28:12,13; Hebrews 7:24,25). Paul embellishes Christ's mission in his epistle to the Hebrews, noting that the Levitical priests offered an imperfect sacrifice "daily"; but now, "we have [Jesus,] such a High Priest, who is seated at the right hand of the throne of the Majesty in the heavens, a Minister of the sanctuary and of the true tabernacle [in Heaven] which the Lord erected, and not man" (Hebrews 7:27; 8:1, 2). Our heavenly Father's Son, "Michael, Prince Emmanuel", meaning "like God", or "God with us", became "the Lamb of God who takes away the sin of the world" (see Isaiah 7:14; 53:10; John 1:29). This means that Jesus (Joshua/Yeshiva in Hebrew meaning "God saves") abolished the Levitical daily-sacrificial-system by offering Himself as a ransom for mankind. Therefore, the old, or temporary Levitical covenant established by Moses is terminated and we now operate under the "original and eternal covenant"--the apostle Paul and King David call it "the order of Melchizedek"; it was God speaking through David and says: "You will be a priest forever according to the order of Melchizedek" (Psalms 110:4; Hebrews chapters four through seven). Under a religious system in effect before Abram was called of God, there was a king and priest of the Most High called Melchizedek. Abraham paid tithes to him and Melchizedek asked God's blessing upon Abraham (Genesis 14:18-20). Melchizedek's dual-system of government modeled the perpetual legal system where God rules the universe from eternity and forever. Jesus is the Supreme Prime Minister, who "continues endlessly"--He heads the eternal and "unchangeable priesthood" as King, High Priest, and God; that is, church and state combined under one impeccable leadership (Hebrews 7:24). "And every creature which is in heaven, and on the earth, and under the earth, and such as are in the sea, and all that are in them, heard I [John] saying, Blessing, and honor, and glory, and power [belong] unto him that sits upon the throne, and unto the Lamb for ever and ever" (Revelation 5:3). Jesus, our "unfallen ruler", must accept our punishment and die for humanity, and by that sacrificial death, the atypical sacrificial system of the Old Testament, with human priests, found complete fulfillment when the "shadow met its "substance"--no longer must we sacrifice animals for the remission for sins. The LORD God offered the first and last blood sacrifices for us. The first sacrifice in Eden was to clothe Adam and Eve with animal skins to cover their nakedness (Genesis 3:21). That act symbolized the last sacrifice at Calvary, when Jesus offered Himself a ransom for your "past sins" (Romans 3: 24-26, Numbers 15:24-36). At the instant Jesus died on the cross the "daily" ministry by Levitical priests, who "perpetually" offered sacrifices in our behalf, was "taken away", or abolished (Daniel 9:27; Hebrews 7:27); but there is more. The Daniel 12 code also reveals another important truth: At that time of history (7740) the prophecy not only indicates the "daily is taken away," but that "the abomination of desolation is set up [i.e., established]" (Daniel 12: 11). Jesus warned His disciples to flee Jerusalem "When you therefore shall see the abomination of desolation, spoken of by Daniel the prophet, stand in the holy place..." (Matthew 24:15; Mark 13:14). A similar description is found in Luke, chapter 21: "And when you shall see Jerusalem compassed [encircled] with [the] armies [of Rome], then know that the desolation thereof is near"; Jerusalem would be "trodden down by Gentiles" for many centuries until "the times of the Gentiles are fulfilled" (Luke 21:20, 24). At the time of Christ, the Abomination of Desolation initially referred to ImperialRome. Previously Rome supported the Jewish religion, but at that time of history (7740), they were "set up" or established. They became the power that crucified Jesus, persecuted God's people in the Coliseum, besieged and destroyed Jerusalem in A.D. 70, and dispersed the Jews throughout the Roman slave market. At the time of Christ, Imperial Rome made a transition from a protective government supporting Judaism (The restoration of that temple with Roman assistance was called "Herod's Temple") to one that would persecute God's people, and later continued this abuse under such titles as "The Holy Roman Empire", ruled by Papal authority. According to the Bible, this system will ultimately be destroyed by fire under the fifth plague (Daniel 7:11, 12; Revelation 16:10). The next chapter is devoted to this most significant topic. Are you beginning to understand the importance of properly understanding the Daniel 12 code? Although some consider "Revelation" a sealed book, its mysteries helped Christians understand and endure their great trials throughout history; however, Daniel 12 is the only chapter the Bible says is closed until our day; God concealed this prophecy until the "end of the days" to not only warn us and help us correctly understand Christ's mission, but to allow greater understanding for those facing unimaginable trials as this period of history closes. It was through God's providence that Jesus controlled the elements, walked on water, healed disease, raised the dead, and performed other miracles in the presence of skeptics. Those acts of creative power proved Jesus' divine origin and authenticated His mission, yet the prideful and self-sufficient attributed them to natural causes, satanic delusion, or trickery; thus, they rejected Christ's ultimate proof of His divine origin and redemptive mission and this sealed their doom (Matthew 12:32). Likewise, there is a class whose senses are thrilled by esters of fragrance emitting from beautiful flowers, and gaze in wonder at the amazing design of splendid creatures like the peacock, or contemplate the metamorphose that forces stiffening catalysts into the wings of the intricately painted butterfly, yet they do not realize these mysteries are speaking of the Master Craftsman's skill and immense love for humanity. This same class may also think the wonderful revelations of the Bible and mathematical repetitions of the hidden code are clever manipulations or insignificant. They, too, are rejecting God's revelation to a lost world, and are scorning the final appeal of heaven to mankind. For this reason, I urge each reader to contemplate the significance of the Daniel-12 code. It is unfolded for your benefit, to add emphasis to neglected truths. Satan despises this message, yet it is essential to prepare us for his final assaults; please do not underestimate the significance of God's last-day revelation. By unlocking the first part of the code we see that the 7740 applied to the first century and illuminated God's plan of redemption. It is now obvious that the number 7740 and many of the other sevens and forties in the Bible pointed forward to one event--God's great atonement to save us, the one rebellious planet in His vast creation, but what about the other number? It is actually quite easy to understand and illuminates God's plan of restoration--the final end of the conflict between good and evil. This will close the celestial controversy and terminate Lucifer's experiment with sin. "Blessed is he who WAITS, and comes to the 1335 days" (Daniel 12:12). The word "blessed" recalls to our memory the eleven "blessings" of Christ's sermon on the mountain (Matthew 5:1-12). And especially the third one that reminds us of the restoration of Eden: "Blessed are the meek, for they shall inherit the earth" (verse 5). That blessing forecasts the most significant time in the eons of God's eternity when the controversy between good and evil is finished, and we "come to the [blessings of the] 1335 days" and when "all these things shall be finished" (Daniel 12:12,7). Multiplying 1335 by our SIX-day code totals 8010 (1335 X 6 = 8010), another encrypted number. Remember, in unfolding Daniel 12 we are dealing with 100-year generations, or centuries. Therefore, the eightieth 100-year generation (80th century, or eighth millennium) from the temptation and fall of man in Eden is truly what the "blessed" have waited for. That is 1,000 years in the future when we literally inherit the earth, Satan is destroyed, and we skip like calves on the ashes of our accuser (this point will be covered in greater detail later). And further in this chapter I have quoted part of the apocryphal writings of Enoch to show that even before the Christian dispensation it was known that the eighth millennium (80th century) starts a new eternity. Now, let us discuss the TEN of the factored number, 8010. Please note that there are ten (10) generations from Adam to Noah--the one ransomed from among the destroyed generation. This number signifies the redeemed from planet earth. You can understand this when you see that the tenth (or tithe) has always represented God's portion--that which He has reserved for Himself. And in Isaiah 6:13 we are told that He will "not make a full end, but a tenth will return... the Holy Seed" (Scripture uses "seed" to denote descendants). The Bible often symbolizes the resurrection of the saints to heaven as harvesting; for example, Jesus said: "The harvest is the end of the world; and the reapers are the angels" (Matthew 13:39; Revelation 14:14-16). So, the tenth of the harvest, or tithe that was returned to God is really pointing to the ten-percent (a figurative number) of God's seed (children) harvested (resurrected) and who will literally "inherit the earth." Another thought for your consideration is, for us, the "end of the days" generation that watches the closing conflict on earth, there will be ten generations (centuries), or 1,000 more years to the rebirth of Eden and the beginning of our new eternity; yes, it will be worth the WAIT. One-thousand years after the saints are resurrected to heaven, the redeemed, those who have WAITED for the fulfillment of God's promises, will return, they "shall inherit the earth; and shall delight themselves in the abundance of peace" (Psalms 37:11; Matthew. 5:5). Truly this is the culmination of the work of redemption--the restoration and repopulating of earth to God's original design--when the peace and perfection of Eden is renewed: "Blessed is he who WAITS, and comes to the 1335 days " (Daniel 12:12). This, too, will be explained in greater detail in other chapters. Most Bible scholars apply the italicized "there shall be" in the rendering of Daniel twelve in the K.J.V. Bible, verse eleven, to centuries, days, or years, but these words are not in the original manuscripts, but were added by translators. By searching libraries and the Internet, you will also find many modern scholars looking for significant starting points to unlock Daniel 12. They juggle dates to reach their different conclusions, but this is speculative because Daniel 12 actually has no starting or ending times for the 1290 or 1335 days--they are just integers (whole numbers) waiting to be deciphered. That is exactly as God would have it because these numbers give greater end-time understanding when God's "six-day creation code" is understood. And by accepting this, you will see the ultimate applications necessary to understand the significant message of the Daniel 12 code: The identity of the Abomination of Desolation, that Jesus is really the Messiah who superseded the "daily" ministries of the Jewish priesthood, and the ultimate time when the paradise of Eden is restored and the conflict between good and evil ends. It is as if Daniel 12 is God's last plea for humanity to remember His ultimate plan and blessings for us, while encouraging our study of His Word to prepare us for future falsehoods; yes, we will be talking about this in other chapters. Did you notice that I previously emphasized WAITS by capitalization? We humans have always exhibited impatience, especially when it comes to God's promises. Jesus was asked by his anxious disciples: "Are you to set up the kingdom at this time?" (Acts1:6). Even John the Baptist grew tired of WAITING in prison and sent his disciples to ask Jesus: "Are you the one, or are we to look for another?" (Luke 7:10). WAITING is not our best talent; yet the prophecy says, "Blessed is he who WAITS." There are numerous prophecies in the Bible of the total destruction of earth, with the elements melting with fervent heat, atmosphere dissolving, and no living person left alive. In spite of the redundancy of doom and gloom, we are like the disciples who were discouraged by their Master's crucifixion--they had hoped for a restored visible kingdom in Solomon's splendor. The majority of Christian denominations now expect the world to be restored in our day and for Christ's earthly 1,000-year reign, but we are told to WAIT until the 80th century--"Blessed is he who WAITS, and attains to the 8010" (Daniel 12:12). Others "spiritualize" or rationalize away these texts showing the impending destruction of earth. Their goal is the same; they make it appear that Messiah is soon to establish His kingdom here for 1,000 years. They, too, choose not to WAIT. By not WAITING, they will be ripe for deception when "he himself [Satan] sits in the temple of God, showing himself to be God" (2 Thessalonians 2:1-12). Jesus will actually rescue us from this destroyed planet when we are caught up in the CLOUDS to meet him in the AIR and go to the mansion prepared for us (see 1 Thessalonians 4:17 and John 14:1-4). Daniel was also told to WAIT: "But you, go your way till the end [your death]: for you shall rest [in the grave] and will arise to your inheritance [in the resurrection of the righteous] at the end of the days" (Daniel 12:13). This subject is also covered in greater detail in another chapter. For now, remember that there is wisdom in anticipating the resurrection and WAITING for the restoration of earth and Christ's literal earthly reign at the beginning of the 8th millennium. WHEN WILL "ALL BE FINISHED?" We can understand when the ultimate "end of the days" is--when everything is finished--by studying the answer to one angel's question: "How long shall the fulfillment of these wonders be?" (Daniel 12:6). The angel Gabriel had previously given an outline of world history occupying more than two chapters of Daniel. The historical sketch closes with the submission of "Egypt; also the Libyans and Ethiopians..." (Once predominately Christian nations, they have submitted to the teachings of Mohammed); Moslems have planted a "palace [mosque] between the seas and the glorious holy mountain [Jerusalem]" (Daniel 11:43-45). Today, most of the land God gave Israel is occupied by others, and all of Daniel's historical prophecies have fulfilled; except "he shall come to his end [Armageddon], and no one will help him" (Daniel 11:43-45). The chapter "Will Israel Save the World?" discusses how Moslems conquered Christian and Jewish nations and their role when, after his brief reign, Lucifer is destroyed in the battle of Armageddon. For now, please note that the angel Gabriel says that two more events comprise the prophecy: "time, times and a half-time" and "the power of the holy people shall be completely shattered" (Daniel 12:7). Gabriel emphasizes that those events conclude his prophecies by saying: "all these things [all of his previously-stated predictions] shall be finished" (Ibid.). Most Bible scholars recognize the timed declaration as one-half of the number seven, where time (singular for one) plus times (plural for two) and one-half time added together equals three and one-half (1 + 2 + ½ = 3½). To understand this number, we must discover a few additional facts: Please recall that God's eternal Ten-Commandment law mentions His six days of creation plus one day of rest. Using God's eternal Law as a model, you will observe that several other combinations of six plus one equals seven are mentioned in the Bible, such as Leviticus 25:3 where the Hebrews were commanded to till the soil for six years, then allow it to remain fallow during the seventh (symbolizing our future sabbath rest, the earth being un-worked during the seventh millennium). Also, Daniel was familiar with "seven times", as Nebuchadnezzar became insane under a sentence of seven times (Daniel 4). You may also remember that Christ nobly entered Jerusalem on "Palm Sunday" and culminated His six-day redemptive week by resting in the tomb on the Sabbath, the seventh day. Another factor to consider is that symbolically we can stretch one day as Peter does: "But, beloved, be not ignorant of this one thing, that one day [is] with the Lord as a thousand years, and a thousand years as one day" (2 Peter 3:8). And a thousand year period is mentioned six times, once in each verse of Revelation 20:2 thorough 7. Chronologists, like the Irish Bishop, Usher, established creation at about October 23, 4004 B.C. Dating from the fall of man to the restoration of earth (still 1,000 years in the future) there is 7,000 years. What does all this mean? Please observe that Daniel's life under Persian rule was located in the approximate MIDDLE of SEVEN MILLENNIUMS. There are three and one-half thousand years from creation to Daniel's era, and after this period, another three and one-half millenniums (times) from Daniel to the end of the seventh millennium (or beginning of the 8th millennium). This is about 1,000 years in the future when "all these things shall be finished" (Daniel 12:7). Because God uses round numbers in Acts 7:6 and Genesis 15:13-16, compared with Galatians 3:17 and Exodus 12:40,41, I was content with the approximate figures, but continued to search for the precise beginning and end of the time, times and half time prophecy that "concludes everything." For several years, B.C. 474 appeared repeatedly in my calculations* displaying the central year of the 7,000-year controversy on earth and the "boundaries" established by God. Research was hampered while in the mission field and away from our home library; then, on August 30, 2004, while studying significant dates in the lengthy introduction to "Esther" in my wife's research Bible, the correct application for that year was providentially discovered. The Bible records a universal death decree that fulfills the heavenly messenger's declaration: "The power of the holy people shall be completely shattered" (Hebrew, naphats: shattered, broken, scattered; Acts 17:6; Daniel 12:7). The wording does not suggest the "holy people will be annihilated, but their "power" will be lost. This happened about 60 years after Daniel's vision when God's "holy people", "all the Jews, both young and old...", faced a universal-death-law on Adar 13 of King Ahasuerus' twelfth year (April 17, B.C. 474). That year the ignoble Haman forced a decree to completely exterminate the Jews throughout the 2,000,000 miles square (5,179,000 KM) Persian Empire, extending from India to Ethiopia (Esther 3:1; 12, 13; Daniel 12:7). The narrative in "Esther" tells how the "power" of the "holy people" was literally "scattered," or "broken" until Mordecai's decree 70 days later on June 25, B.C. 474 authorizing self defense. It gave permission to utterly "destroy, kill, and annihilate" the forces of those assaulting the Jews. Under Mordecai's decree their "power" was completely restored, more than 75,000 of their enemies killed, and many people of understanding "became Jews" (Esther 8:9,11,17;9:16). The following chart shows that Haman's decree marks that significant point in the center of the 7,000 year conflict between the forces of good and evil on earth, dating from Adam's temptation** to the re-creation of earth; also, B.C. 474 affirms the date of Adam's "fall", and that date correlates remarkably with the forty centuries to the year A.D. 27 when John the Baptist began his ministry and baptized Jesus: that year was the "last Adam's" temptation and victory over Satan's enticements. years = THE CENTER OF THE CONFLICT ON EARTH + 3,500 years = 3027 A.D.
A year for Armageddon and the resurrection is not included on this chart because, as explained later, these events are determined by fulfilled prophecies, "watch and be ready", and are not based on timing (Matthew 24:42, 50). **The 30 years in this chart indicates that the inclusion of earth in the galactic drama between Lucifer and God began in Eden at the deduced date of 3974 B.C., 30 years after creation ( - 4004 + 30 = - 3974 B.C.). After forty centuries (generations) Jesus, "the last Adam", was victorious over temptation at about age 30 and resumed the lost dominion of "the first Adam" (1 Corinthians 15:45; Luke 3:23). And the Levites also represented Jesus' ministry by their appointment to the priesthood at age 30 (Numbers 4:30). We may conclude that Adam and Eve met Satan thirty years after creation, precisely three and one-half millenniums before Haman's infamous decree, marking the beginning of the "fall" and degradation of earth. Therefore, the year 3974 initiates the elapsed time of 4,000 years (40 centuries/generations) from Adam's temptation and fall to Christ's wilderness temptation and victory ( - 3974 + 4000 + 1*** = 27 A.D.), and 3,500 years to Haman's infamous decree in 474 B.C. ( - 3974 + 3500 = - 474 B.C.). The death-decree of Haman against God's people, and Pilate against our Savior, both occurred after three and one-half units of time. Haman's in B.C. 474; and Pilate's in A.D. 31, which was 3 ½ years after Christ's victory over Satan's wilderness enticements in A.D. 27--God gave His people victory through both of those events. How appropriate that God permitted Haman's decree at the central point of the 7,000-year conflict on earth to expose Satan's hatred against the saints. Your adversary the devil knows he is condemned for stealing subjects from God's kingdom and would execute death decrees "daily" against the "holy people" except God especially intervenes in their behalf. Knowledge of God's deliverance from Haman's death-law should revive our commitment to remain faithful to His commandments because of an increased appreciation of God's concern, love, goodness, and special care in our behalf. Said Jesus: "He that has my commandments, and keeps them, he it is that loves me: and he that loves me will be loved of My Father, and I will love him and will reveal myself to him" (John 14:21). ***Use your calculator to confirm my figures. Remember that there is no year zero in chronological time, so one year must be added when crossing from negative years, B.C. (or B.C.E., for Before Common Era), to positive years, A.D. (or C.E., for Common Era). If you are content with this chart, or mathematics frustrates you, then advance to the paragraph entitled: "THREE MORE EVENTS TO FULFILL." Three and one-half millenniums (3,500 years) from Haman's decree extends to A.D. 3027; again, that closes the conflict on earth about 1,000 years in the future ( - 474 + 3500 + 1 = 3027 A.D.). This is the second-half of the 7,000-year portion of the cosmic conflict on earth, and 3,000 years after the beginning of Jesus' public ministry in A.D. 27 (27 + 3000 = 3027). The first 3,500 years of the conflict, from creation and after Adam's fall, to Haman's decree, can be calculated like this: - 4004 + 30 + 3500 = - 474 B.C. These figures are authenticated by the well-known year of Jesus' baptism and confrontation with Satan in the autumn of A.D. 27, "in the fifteenth year of Tiberius Caesar" (Luke 3:1, 2). Remember, Jesus is the one who abolished the eternal sacrifice, and His embryonic humanity began 40 generations (centuries, or 4,000 years), after the creation of Adam: ( - 4004 + 4000 = - 04 B.C.). Likewise, in A.D. 27, 40 centuries after Adam's fall, "the Spirit drove... [Jesus] into the wilderness... [to be] tempted of Satan", and Jesus earned the right to be our "second", or "unfallen" Adam ( - 3974 + 4000 + 1 = 27 A.D.; Mark 1:12, 13; 1 Corinthians 15:45). From Christ's temptation in A.D. 27, 3,000 years remain in the conflict, again, taking us to the year A.D. 3027, three and one-half millenniums after Haman's decree( 27 + 3000 = 3027 A.D.). The year of Jesus' humanity (conception) to His baptism and the beginning of His public ministry can likewise be expressed as: ( - 04 + 30 + 1 = 27 A.D.); again, that is the year of Christ's victory over sin, at the same age we have determined for Adam's failure. The year B.C. 4004 can also be used to locate Christ's victory over Satan's wilderness temptation by adding 40 centuries (4,000 years) to the inferred date of Adam's fall at age 30 as follows: ( - 4004 + 30 + 4000 + 1 = 27 A.D.). *Perhaps these calculations have overwhelmed you, or you are aware of alternative dates. I have no controversy with those who contest my logic, and am quite content with approximate (round) numbers, but God is all-knowing. We can confidently trust our Leader because "He... has determined the times before appointed, and the bounds of their habitation" (Acts 17:26; Genesis 1:14). Although explained in greater detail in other chapters, for now we will briefly acknowledge three events fulfilling after Haman's decree and before, as the messenger state, "all these things shall be finished" (Daniel 12:7). First: Michael the Great Prince resurrecting "those who sleep in the dust of the earth" (both good and evil) when the earth experiences "a time of trouble, such as there never was since there was a nation..." (Daniel 12:1). Although some graves opened during the earthquake at Christ's death on Friday, the dead did not come forth until "AFTER His [Sunday] resurrection" from the grave; this possibly included the repentant thief--Jesus promised him on Friday ", you shall be with me in paradise" (Matthew 27:52; Luke 23:43). But the general resurrection that Jesus spoke of is "the resurrection of life" and a few wicked (that pierced Him--Revelation 1:7; Matthew 26:64) at our time of history, and the much larger "resurrection of damnation" is 1,000 years in the future (John 5:29; Revelation 1:7; 20: 3,4). Second: Those "found written in the book [of life] shall be delivered" (Daniel 12:1). The saints were delivered after Haman's decree, and before the destruction of Jerusalem in 70 A.D. They will also be saved after a death law during our time of history and, once more 1,000 years in the future when Satan marshals the wicked to destroy the saints in the Holy City that descends from heaven (Revelation 13:15; 20:7,9). Third: "The power of the holy people has been shattered" (Daniel 12:7). As previously noted, this occurred by Haman's decree. It also repeats when a death decree is passed before Armageddon, and once more when Satan mobilizes the wicked to attack the saints 1,000 years in the future. These episodes will end the controversy between good and evil in A.D. 3027 when "the fulfillment of these wonders shall be" and "the wise shall shine like the brightness of the firmament... forever and forever" (Daniel 12:3, 6). These important events, finding their ultimate fulfillment about 1,000 years in the future, are emphasized two times in Daniel 12: by the time, times, and one-half time prophecy and the "blessings" of the 1335 days (8010). When it is "doubled... it is because the thing is established by God, and God will shortly bring it to pass" (Genesis 41:32). God does not want anyone to err on understanding these final events closing the conflict between good and evil and restoring peace to His universe. That is when Lucifer and the resurrected wicked are destroyed (Ezekiel 28: 18, 19). And that act closes the conflict between God and His rebellious angels, when sin and sinners are eliminated from the cosmos (Other times-times-1/2 time prophecies repeat with related numbers throughout the Bible; these also had a valid historical applications during the tribulation and will be discussed in the next chapter. "And I blessed the seventh day, which is the Sabbath, on which He rested from all His works. And I appointed the eighth day also, that the eighth day should be the first-created after my work, and that the first seven revolve in the form of the seventh thousand, and that at the beginning of the eighth thousand [again, 1,000 years in the future] there should be a time of not-counting [without death and decay, time will loose its significance], endless with neither years nor months nor weeks nor days nor hours" (Secrets of Enoch, 32:4; 33:1; quoted from "The Lost Books of the Bible..." 1926, Alpha House, Inc. ISBN 0-529-03385-2). "In as many days as this world was made, in so many thousand years shall it be concluded. . . . For the day of the Lord is as a thousand ... years: and in six days created things were completed: it is evident, therefore, that they will come to an end at the sixth thousand year." Against Heresies, Book v. chap. xxviii. sect. 3. Properly understood, Daniel 12 is an important augmentation to our knowledge. God wanted this revealed in the last days, as Daniel says: "I heard, but I understood not: then said I, O my Lord, what shall be the end of these things? And he said, Go your way, Daniel: for the words are closed up and sealed till the time of the end. Many shall be purified, and made white, and tried; but the wicked shall do wickedly: and none of the wicked shall understand; but the wise shall understand" (Daniel 12:8-10). So what can we look forward to in the near future? As you now know, the final destruction of this planet and a resurrection to heaven for 1,000 years (See John 14:1-4 and Revelation 20). I look forward to the voyage to heaven, and can WAIT for the earth to enjoy its Sabbath rest, and after the seventh millennium, we can celebrate eternity together in Eden restored on this re-created planet (Revelation 21). Chapter 24 of Isaiah describes the soon-coming last-day on our celestial globe and tells us the reason for its demise: "The earth is also defiled under its inhabitants, because they have transgressedthe laws, changed the ordinance, broken the everlasting covenant. Therefore the curse has devoured the earth and those who dwell in it are desolate. Therefore the inhabitants of the earth are burned, and few men are left" (A few living saints will survive the heat to participate in the resurrection of the righteous (verses five and six quoted). Man's law may change each time parliament sits or a judge rules, but God's law is unchangeable. Please observe that Isaiah said the earth is destroyed because of a change in law--this must certainly mean God's eternal Ten-Commandment law. A power did attempt to do this, and thought to CHANGE God's law dealing with TIME. This power is the same "abomination of desolation" that we just discovered in Daniel 12. It says, "And he [this power] shall intend [or think] to change TIMES and law..." (ch. 7:25). God said: Therefore the curse has devoured the earth, that is, transgressing, changing, or breaking, God's law causes the seven last plagues, and that subject is to be covered in another chapter. Perhaps you do not remember which of God's Commandments was changed that deals with TIME; discover for yourself by reading them in Exodus 20: 3-17 (Appendix). I hope you have been blessed with a strengthened faith in Jesus our Savior, and possess a greater understanding of God's control of the destiny of earth as revealed in this study. But before we close this chapter, there is another subject that needs discussing: A word of caution to millennialists. Millennial fever has inoculated many in our world today and an anxiety plagues Christendom as some count years and set dates for Christ's coming and Armageddon. This is as Satan would have it because, as the dates pass uneventful, scoffers are emboldened to continue in transgression and the embarrassed speculators loose faith in the Scripture--some are lost to disappointment, skepticism, and unbelief. In anticipation of this, in 1996 I wrote letters to some concerned individuals telling them that an earlier figure of the seventh millennium,October22, 1996, would pass uneventful. I repeated that admonition for Y2K; and again here, for your benefit; because, Christ's second coming is not bound to specific dates such as those beginning with creation, Adam's failure, or Jubilee-year speculation. I might suggest that certain events happening in the first century must repeat sequentially in our time. For example: Since Jesus was tempted in all ways as us (Hebrews 4:15). And at the age of 30 Jesus met Satan in the wilderness in 27 A.D., knowing that Haman's death decree was on April 17, one might be bold enough to suggest the saints will also meet Satan on April 17 of the year 2027 A.D., six millenniums after the inferred date of the Edenic fall. Then Jesus faced a death sentence in 31 A.D.--likewise, the saints must also meet a death decree (to be discussed in another chapter). Following this millennial logic, could a death decree be slated for 2031 A.D.? Then, probation closed for the Jews in 34 A.D. (discussed in chapter four) so, 2034 A.D. is a logical derivative for the close of man's probation; but there is more. Jerusalem was destroyed in A.D. 70--the fortieth Passover from Jesus' crucifixion--could this set the year 2070 as the time for Armageddon, which will also destroy Jerusalem and the world? I stimulated others to deeper thoughts with this millennium hypothesis in 1995, and it is as good as any one can imagine, but IT IS NOT FACTUAL. There are some secrets that God will not reveal: "The secret things belong unto the LORD our God: but those things that are revealed belong unto us and to our children for ever, that we may obey all the words of this law" (Deuteronomy 29:29). Our duty is to trust God's faithfulness and, through His enabling presence, obey all the words of His law while preparing for Christ's coming. The year 2070 may very well pass uneventful; it has NOT been given us to know the exact "times and seasons" (Acts 1:7). As the guardian angels of earth are now allowing increased calamities, our "hearts are failing us for fear." We just can not imagine that this world will last much longer. And tomorrow you may carelessly step from the curb as a truck approaches and, one might say, Instant Armageddon! Concerning theoretical dates for Armageddon and Christ's coming, God is not bound by any specific dates or times, as the author of Romans states: For He will finish the work and cut it short in righteousness, because the Lord will make a short work upon the earth (Romans 9:28). Jesus made several statements that tell us His coming is not restricted to timing, but by events that God controls: "He that shall endure unto the end, the same shall be saved. And this gospel of the kingdom shall be preached in all the world for a witness unto all nations; and then shall the end come"; and, "when these things begin to come to pass, then look up, and lift up your heads; for your redemption draws near" (Luke 21:28; Matthew 13, 14). Jesus could have come before this if conditions had properly fulfilled; this means we must "Watch therefore...." for "that day and hour knows no man, no, not the angels of heaven, but my Father only" (Matthew 24:42; 24:36). Therefore, my concerned brothers and sisters, this side of heaven nobody knows exactly where to date Armageddon or the resurrection, and our mathematical calculations only reveal the timing of the overall controversy; they are worthless for predicting the exact time of "dooms day." It is a definite fact that Jesus is coming, and sooner than we might suspect; meanwhile, He has given us a work to do. Like Noah, the "preacher of righteousness", we must share biblical truths and warnings, while watching; because, we will see Jesus' return when we do not expect Him (2 Peter 2:5; Matthew 24:44). So please do not become weary of God's apparent delay; He has not forgotten us. And, above all, remain faithful while watching and praying to be kept for that coming. His people to receive vital truths occurring before He returns. And just the fact that the Daniel 12 code is revealed tells us we are living at "the time of the end" (Daniel 12:4, 9). Thank you for reading this chapter, and I hope it has not left you confused. Some parts of the Bible are easy to understand; for example, Habakkuk speaks of the Lord's second coming with visible "rays of light flashing from His palms" (Habakkuk 3:4, margin: side,). And Zechariah describes our looking on "Him whom they have pierced" (ch. 12:10). This means we will plainly see the wounds Jesus received at Calvary. But it takes a "deciphered" interpretation to understand that Eve's being given to Adam by a wound in his side at creation, really revealed God's remedy for sin before the fall, as the Messiah, Jesus Christ, would receive His people through the blood He spilled from his side on the cross: "He was wounded for our transgressions.... He was cut off [killed] from the land of the living; for the transgressions of My people He was stricken. And they made His grave... at His death, because He had done no violence, nor was any deceit in His mouth", and, "I am He who lives, and was dead, and behold, I am alive forevermore..." (Isaiah 53:5; 8, 9; Revelation 1: 18). Much that Christ taught was confusing to the people because He spoke in "encrypted" or symbolic language. He acknowledged the unbelief of these listeners and commented: "The words that I am speaking to you are spirit and life" (John 6:63). The religious leaders were inclined to be teaches of the Word and, although the insignificant carpenter from Nazareth pointedly told the truth, they thought themselves above receiving religious instruction. Likewise, we must wisely evaluate our biased education and motives, and avoid the mistakes of those who rejected the very truths that would have been a "savor of life unto life" (2 Corinthians 2:16). Because some of the events foretold in Daniel 12 undoubtedly conflict with what you have been taught, please make them a subject of deep contemplation and prayer because "the wise will understand." The proper understanding of Daniel 12 requires a belief in God as our Creator and faith in Bible chronology. The following photographs were taken by my wife, Tish, and me. The first photo is from the Griffith Observatory in the Los Angeles area. The others at the CreationEvidencesMuseum in DinosaurPark near Glen Rose, Texas; they are used with permission from Dr. Carl Baugh. You will find that this evidence sustains the flood and biblical creation. 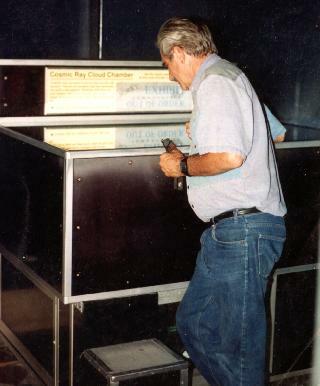 The following photo shows me looking at an ammonia solution under vacuum at an older display in Griffith Observatory, Los Angeles (That chamber has been replaced by a cosmic-ray animation). This impressive apparatus allowed one to see visible evidence of cosmic-ray penetration to the surface of earth. Called a Cosmic Ray Cloud Chamber, small bursts of vapor appeared on the surface of the ammonia about every two seconds as tracers from cosmic-ray bombardment. Today, the volume of water in our oceans would cover a perfectly spherical earth to a depth greater than 6,000 feet (2,000 meters). The Bible says: "The Spirit of God was hovering over the face of the [pre-existing] waters." "And God made the atmosphere, and divided the waters which were under the atmosphere from the waters which were above the atmosphere; and it was so" (Genesis 1:2, 6). On the new earth all will be restored as John says: "There was no more sea" (Revelation 21:1). With a tremendous volume of water again encircling the earth, like a huge green house, we will be protected from harsh radiation, including cosmic-ray bombardment. "And it shall come to pass in that day, that the [diffused] light [of the sun] shall not be clear, [or] dark. ...at evening time it shall be light" (Zechariah 14:6, 7). Carbon 14 is formed in our atmosphere by cosmic rays. That level continues to increase and has not reached equilibrium level; meanwhile, accurate measurements also show the magnetic field of our earth is decreasing exponentially. Radioactive carbon 14 dating assumes that there was always significant levels in antiquity. Yet, if the "water shield" of earth absorbed cosmic rays, and its increased magnetic field deflected them, no living creature before Noah's flood could contain carbon 14. This is one reason why organisms living before the flood display erroneous ages, like millions of years. 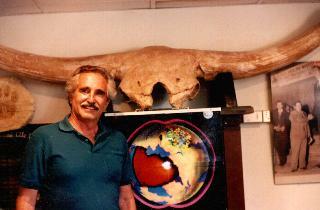 I am standing next to the large skull of a bison. Evolution attempts to establish a higher order of beings with the passage of time, yet this bison would have stood over three meters (10 ft.) tall at the shoulders. They have discovered shells called ammonites which were two meters (6 ft.) tall, and the height of reeds that grow next to ponds 18 meters (60 ft.), with seed pods (cat tails) of three meters (10 ft.) length. Obviously, creation has undergone decay since Eden. 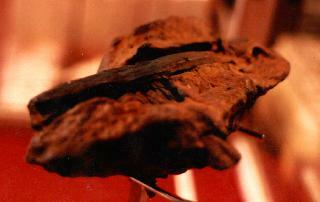 This petrified finger belonged to a "prehistoric" human, and was found in cretaceous limestone. It is broken short of the middle joint, and measures 7.6 cm (3 in.). At full length it would measure about 15 cm (6 inches). Excavations of this limestone also revealed a child's tooth and human hair. 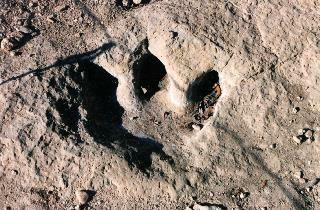 We photographed this dinosaur footprint in cretaceous limestone on the banks of the PaluxyRiver. It is approximately 30 cm (one ft.) across, and located with similar tracks. Early excavations in this area revealed human footprints inside the dinosaur tracks leading to rumors that the human prints had claws--later excavations uncovered human foot prints up to 64 cm long (25 inches) next to the dinosaur prints--this discounted the rumors. A human hand print was also uncovered. The term cretaceous means that dinosaurs occupy that period of geological history. Human prints contemporary with dinosaurs contradict modern evolution theories because mankind was not to evolve for another 75 to 100 million years. This is one of many human footprints contemporary with dinosaurs taken from the PaluxyRiver located in DinosaurPark near Glen Rose, Texas. 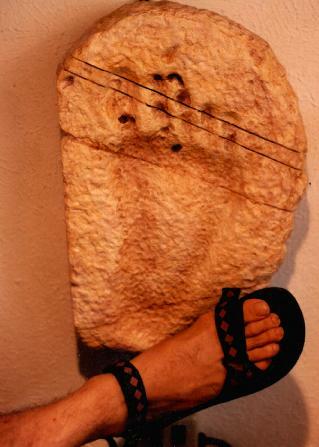 It is contrasted with my sandaled foot, and exceeds 45 cm (18 in.) 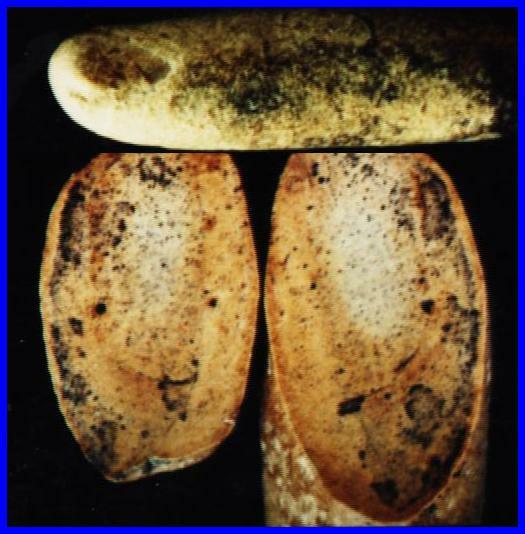 in length.The cross sectional cuts allowed compression studies, and indicated that it was probably a woman's footprint. Estimates of this woman's stature are approximately 305 cm (10 ft.) and 454 kg (1,000 lbs.). Several strata of human prints with dinosaur prints have been excavated in this park. According to Dr. Carl Baugh, the archeologist who coordinated the excavations, these strata were laid down during the first few days of Noah's flood when water levels were low enough to allow daily tidal changes to form layers of mud so fleeing creatures could seek higher ground--the upper strata showed no prints because the flood waters were too high. This interesting photograph is of a hammer found in similar strata. Its iron head and wooden handle are solidified in sandstone. Metallurgical studies show that it was constructed of a type of iron that could not have been made under present atmospheric conditions. It is believed that before the flood our atmosphere was compressed to approximately twice its current density and no ultraviolet radiation. Obviously, the people who lived contemporary with dinosaurs were intelligent, and the footprints indicate that they were quite human as the large toe on primates is located closer to the heel to facilitate clinging to branches. Doctor Hilton Hinderliter of Apollo Campus, Pennsylvania State University, studied the evidence presented at the Glen Rose, Texas, excavations and stated: "I would have to say that the belief in evolution is in a state of terminal illness but its death will only be admitted by a new generation of scientists whose minds have not been prejudiced by the type of education now prevalent in the nation's public schools, an education which starts with the belief that evolution has happened, which interprets all evidence according to that faith and which simply discards any evidence which cannot be fitted into the evolutionary framework' (Quoted with permission from Dinosaurs by Dr. Carl E. Baugh, 1987. Promise Publishing Co., Orange, CA92667). The Bible speaks of these majestic people who lived in Noah's day. Of them it is said: "For since the creation of the world His invisible attributes are clearly seen, being understood by the things that are made, even His eternal power and Godhead, so that they are without excuse, because, although they knew God, they did not glorify Him as God, nor were thankful, but became futile in their thoughts, and their foolish hearts were darkened. Professing to be wise, they became fools..., who exchanged the truth of God for the lie" (Romans 1:20-22, 25). This document is covered by United States and International copyright, ©1998 with major revision 2006, by Charles H. Clever. All rights reserved.